The thought of smooth, creamy, luscious homemade ice cream transports me in a cool, happy zone. I regularly make ice cream for my family. We never wait for any special occasion to have this wonderful treat. My ice cream was very popular at “Pick-a-Bite.” I dedicate this Chocolate Ice Cream to my husband, who loves chocolate & just cannot resist anything in chocolate. This is his all time favourite flavour. 100 gms of Cocoa pwd. Mix the sugar with corn flour & salt in a saucepan. To this add milk & beaten eggs. Stir the mixture until well-blended & smooth. Place the pan over low heat & cook, stirring constantly for about 30 to 45 mins. until the custard thickens & coats the back of a spoon. Remove the saucepan from the heat. Cover the surface of the custard with a damp grease-proof or waxed paper. Let the contents cool. Put the pan in the fridge & chill for about 2 hrs. Mix cocoa powder with milk. Then blend cocoa paste, fresh cream & vanilla essence with the chilled custard in a blender. Pour this mix in a container & freeze. 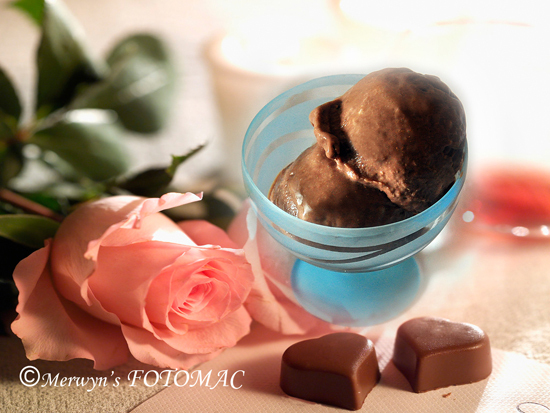 Your homemade Chocolate Ice Cream is ready to serve. Enjoy this cool anytime treat. Tip : Freezing in aluminium containers sets the ice cream quickly.